Next Generation Central Office (NGCO) is a new reference architecture for fixed and mobile networks that applies hyperscale principles to servers, switches, storage and rack systems. The panel is moderated by Roy Chua, Founder and Principal of AvidThink, formerly SDXCentral. Participants include Mike Yang, President of QCT; Paul Schultz, VP of Network Services Strategy and Solutions at KPG Co; and Dan Rodriguez, VP of Network Platforms Group, Intel. 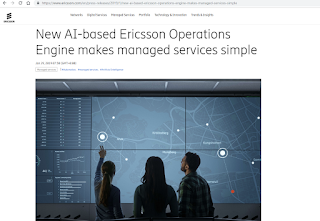 Ericsson launched an Artificial Intelligence (AI)-based managed services offering for communications service providers. Peter Laurin, Senior Vice President, Head of Managed Services, Ericsson, says: “Networks are quickly becoming significantly more complex to operate as we introduce IoT and 5G at scale, and virtualize core networks, while aiming to enhance user experience at the same time. The Ericsson Operations Engine enables us to create sustainable differentiation for our managed services customers as it evolves operations from being network-centric to user experience-centric. It fundamentally changes our way of operating networks from reactive to proactive, leveraging data, automation and artificial intelligence." 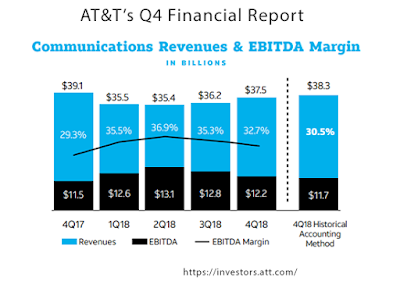 AT&T reported Q4 revenue of $48.0 billion versus $41.7 billion in the year-ago quarter, up 15.2%, primarily due to the Time Warner acquisition and partially offset by declines in legacy wireline services, wireless equipment, domestic video and Vrio. "Our top priority for 2018 and 2019 is reducing our debt and I couldn’t be more pleased with how we closed the year. In 2018, we generated record free cash flow while investing at near-record levels. Our dividend payout as a percent of free cash flow was 46% for the quarter and 60% for the year, allowing us to increase the dividend for the 35th consecutive year,” said Randall Stephenson, AT&T chairman and CEO. “This momentum will carry us into 2019 allowing us to continue reducing our debt while investing in the business and continuing our strong record for paying dividends." Total wireless revenues were $18.8 billion, down 2.1% year over year. On a comparable basis, revenues were down 0.6% due to a decline in equipment revenues, which was mostly offset by an increase in service revenues. 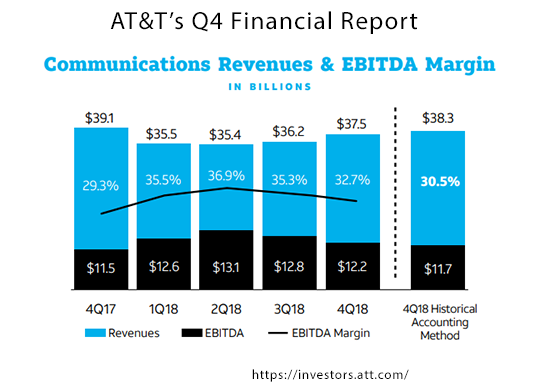 Wireless service revenues of $13.9 billion were down 3.0% year over year due to accounting changes, or up 2.9% on a comparable basis, due to subscriber gains and pricing actions. Wireless equipment revenues increased 0.5% to $4.9 billion. On a comparable basis, equipment revenues were down 10.9% due to lower postpaid smartphone sales. Postpaid phone-only ARPU decreased 4.1% versus the year-earlier quarter. On a comparable basis, phone-only ARPU was up 3.0%. Postpaid churn was 1.24%, up from 1.11% in the yearago quarter largely due to limited promotional activity. Postpaid phone churn was 1.00%, compared to 0.89% in the year-ago quarter. Branded churn was 1.82%, compared to 1.75% in the year-ago quarter. basis, excluding the impact of revenue recognition, revenues were down 3.0%. Total video revenues were down mostly due to declines in linear TV subscribers partly offset by higher advertising sales. Broadband revenues were up 6.4% due to an allocation adjustment for bundled discounts and higher revenue from fiber customers which was partially offset by legacy declines and simplified pricing. The Entertainment Group lost 32,000 broadband subscribers in the fourth quarter. at the end of the quarter, totaled 13.7 million. AT&T now markets its 100% fiber network to more than 11 million customer locations in parts of 84 metro areas. Broadband penetration in the fiber footprint continues to be significantly higher than in AT&T’s non-fiber footprint and is nearly 50% in locations marketed to for more than 30 months. In Business Wireline, declines in legacy products were partially offset by growth in strategic business services. Total business wireline revenues were $6.7 billion, down 8.9% year over year, or down 4.2% on a comparable basis. Strategic business services, the wireline capabilities that lead AT&T’s most advanced business solutions, continued to grow. Revenues grew by about $75 million on a comparable basis, versus the year-earlier quarter. On a comparable basis, these services represent 44% of total business wireline revenues and are an annualized revenue stream of more than $12 billion. Farice ehf, which operates two submarine cables to Iceland, is planning a new submarine cable to Europe with a likely landing site in the UK or Ireland. A new study involves selecting landing sites for the new submarine cable as well as project management for a seabed survey expected to take place in the year 2019. Farice's existing submarine cables include FARICE-1 to UK and DANICE to Denmark. A third submarine cable Greenland-Connect connects Iceland to Canada and US. The future cable would be the fourth cable connecting Iceland and increases further the security and resiliency of Iceland´s international telecommunications that are already of a high standard. 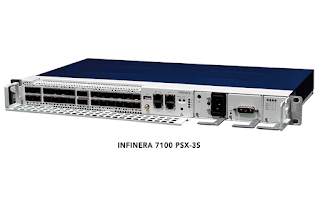 Infinera introduced a compact, high-density 1 rack unit (1RU) metro packet-optical platform for access and aggregation of diverse metro traffic types, including high-speed Ethernet and 10 Gbps and 100 Gbps WDM. Currently in customer trials and available for commercial deployment. 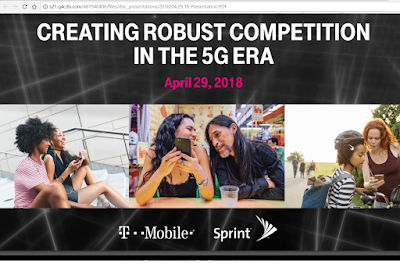 Once their merger is complete, T-Mobile and Sprint will open five, new, state-of-the-art Customer Experience Centers around the United States. The facilities will offer T-Mobile’s Team of Experts (TEX) service, which provides customers with personalized support. The companies estimate each of these facilities will create an average of 1,000 new jobs. The first of the five new facilities will be built in Overland Park, Kansas. “The heroes who work in our Customer Experience Centers show customers every day why they chose the Un-carrier – and that will not change with the New T-Mobile. With these five new Centers, we’re going to give even more customers across the U.S. the rock star treatment they deserve!” said T-Mobile US Chief Executive Officer John Legere, who will lead New T-Mobile as CEO. “Choosing Overland Park as our first new Center site was a total no-brainer." 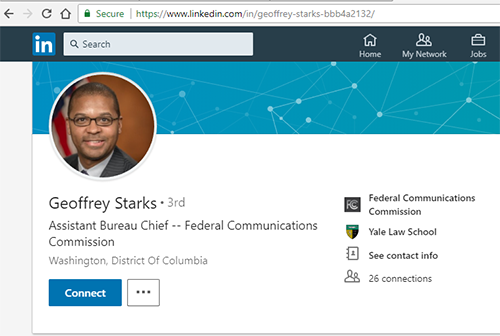 Geoffrey Starks was sworn in as FCC Commissioner. Starks previously served as assistant bureau chief for the FCC's Enforcement division. Before that, he served at the Department of Justice as a senior counsel to Deputy Attorney General Jim Cole. He has a JD from Yale Law School. Commissioner Starks issued the following statement: “I am deeply honored to serve as a Commissioner of the Federal Communications Commission, and I thank the President and the United States Senate for this exceptional privilege. As the last few weeks have affirmed, being a public servant is a calling to serve a mission bigger than yourself. Throughout my career, I have focused on protecting the most vulnerable and holding wrongdoers accountable." ADVA's FSP 150-GO102Pro Series is among the first technologies to receive MEF 3.0 CE certification. 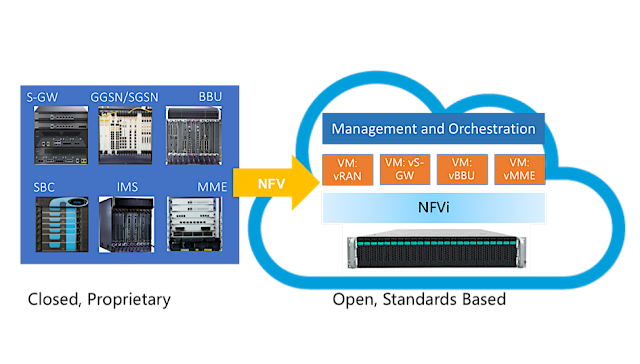 Compliance with the new specification demonstrates that ADVA’s Carrier Ethernet (CE) and IP service demarcation solution supports the transformation to automated networking and can be used to build 5G-ready architectures. ADVA's compact cell site gateway device, which was introduced in December, provides Carrier Ethernet and IP service demarcation for small cells deployed outdoors in locations such as walls or lampposts. The FSP 150-GO102Pro, which is billed as the world’s smallest cell site gateway device, delivers precise time and frequency synchronization. 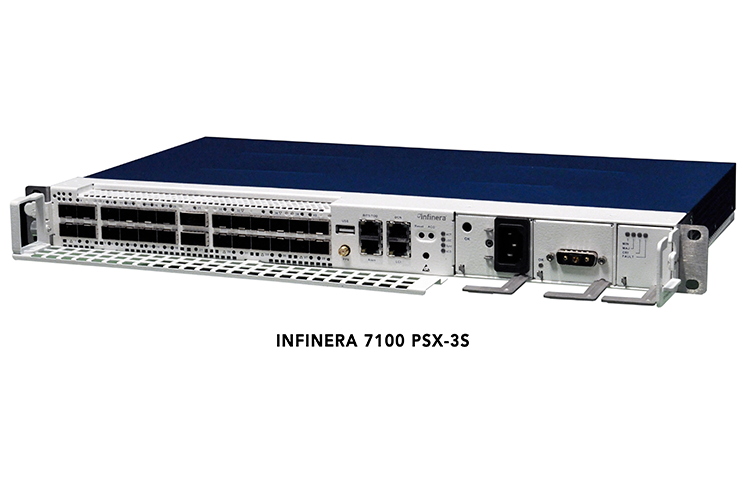 It features automated testing and in-service monitoring and is available in two sizes. A hardened housing is sealed against water, moisture, and dust. 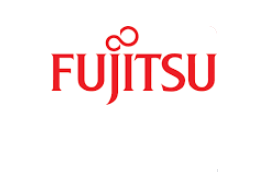 Fujitsu Network Communications has expanded its Internet of Things (IoT) technology platform for smart utility applications by adding ClearWorld and GreenStar as ecosystem partners. Fujitsu is empowering utilities and communities with utility solutions including GreenStar world-class LED-based luminaires and ClearWorld solar energy systems in a complete IoT platform.